We have all been encouraged by the life story as well as the writings of this conservative commentator. For the Christian, there are a few things that cannot be accepted. 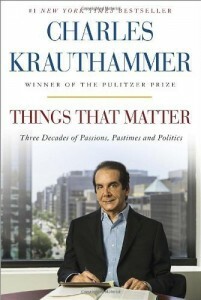 Krauthammer does not believe that life begins at conception (p. 200) nor does he believe that creation is acceptable science (p. 210). However, his essays on the nation of Israel in relation to America are great, and his three last essays on America and the World are themselves worth the price of the book. His description of the new liberalism seeing America as fatally flawed and therefore undeserving of the position of a world power; and his option of America using the “unipolar world” (America as the ONLY world power) for a realistic global democratic example, are great.